Picture this: You’re sitting on the lawn of the Washington Monument, the Fourth of July fireworks show in full swing, gearing up for the big finale, with thunderous streams of red, white, and blue crashing across the sky. Now imagine being there with your four-legged friend sitting right beside you. Just because you go on vacation does not mean you have to leave them behind. Instead, leave the guilt behind and take your furry friend with you on your next trip! Taking your bestie with you can be easy, especially given the improvements with airport doggie-relief areas. 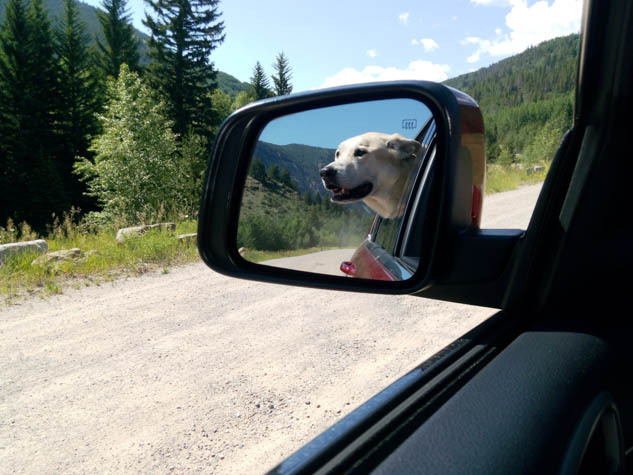 Mitchell, my lab/Anatolian mix, has gone sightseeing in Niagara Falls (Canadian side) and the Black Canyon in Colorado; strolled around Chicago; camped out in Utah, Colorado, Virginia, and Maryland; and played in the ocean in Virginia Beach, VA and Wilmington, NC. We had only one mishap where the hotel we booked ended up being under construction when we arrived, and had referred us to its sister property across the street. That hotel did not allow pets, so there I was, sneaking a big, blond beast in and out of the hotel the entire weekend. Traveling with pets though does require some planning, so here are a few things to consider. National Parks: Some national parks do not allow pets and none allow pets off-leash. Hotels: Many hotels will allow dogs for an extra fee, sometimes an additional deposit. Some will even provide a pet bed for your bestie. Airlines: At 105 pounds, Mitchell is not too heavy to fly; however, he is too tall to ride in the largest airline-approved crates. Check with your individual airline for specific rules on vaccinations, crate requirements, restrictions for flying during particular times of the year due to heat, etc. Borders: Your vet will be able to provide a proof of vaccinations sheet that you can take with you as you head into another country. Contact the U.S.-based embassy of the country you will be visiting to verify which shots are required. Is your buddy car-ready? Do a check-ride to find out ahead of time. Seatbelts: Not just for humans – there are various methods out there to keep them secure. Pit stops are essential. I usually do not stop until I need gas unless I am traveling with pets. In this case, I make a point to get out at least every four hours for a romp and bio-break. Traveling with pets can present certain challenges, but that doesn’t mean they have to stay behind. Planning ahead can avoid running into trouble (and sleeping in your car) and having travel insurance will prevent any other unforeseen circumstances from cutting your trip short as well. I used to feel guilty when I would go on vacation and leave Mitchell at home while I went out on adventures. Therefore, I started taking him along with me. It was not always easy traveling with a 105-pound dog who was very obviously too large to hide in some hotels. At this point though, my furry travel companion has seen more places than many people I know. Plan a weekend in Chicago you and your friends will never forget and start with these ideas. Former travel disaster, now a serial traveler, travel safety advisor, and author of The Travel Safety Handbook. Poster boy for learning from others mistakes. Now I provide travelers with the tools to focus on their travel goals; I advise business travelers,prepare study-abroad students and equip families with the knowledge to return home successful with memories that will last a lifetime, not horror stories. Follow JC on his blog at Travel-Safer.com, on Facebook, or on Twitter.